Since ALMA was founded in 2002, 8 women and 5 men has been awarded. For more than a century, The Nobel Prize in Literature has awarded 14 women and 99 men. Will the gender gap grow or decrease? Not surprisingly, mostly women are committed to children’s literature (as well as children’s culture at large). Today, on International Women’s Day, we can’t help wondering: Why is this a gender issue? International Women’s Day (March 8) is a global day celebrating the social, economic, cultural and political achievements of women. Of course, we want to highlight Meg Rosoff, Barbro Lindgren, Isol, Kitty Crowther, Sonya Hartnett, Katherin Paterson, Lygia Bojunga, Christine Nöstlinger – all laureates of the worlds largest international children’s and young adult literature award. 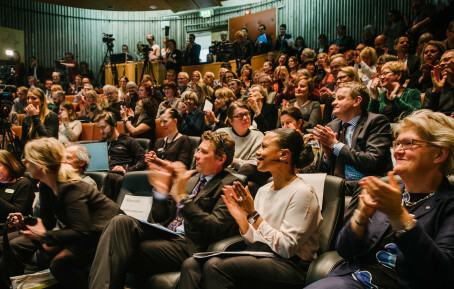 The award, which amounts to SEK 5 million, indicates that writing for children and young adults is extremely important. Children’s and young adult’s access to literature is a precondition for democracy and openness.